Each of Jack London’s short stories is a valuable lesson about life and natural laws. As said by the French philosopher Jean Jacques Rousseau: “Man is (physically as weak as) a reed, but he is a reed that thinks.” (L’homme n’est qu’un Roseau, mais un Roseau pensant.) The history of humankind is that of persistent struggles for life. Facing the powerful and mysterious nature, men are so tiny, weak and fragile. But thanks to the strength of thoughts and will, men have subdued and controlled nature to exploit its energies to serve the needs that have been more increased. Thoughts help men’s ability to develop and strong will helps men’s strength multiply. Except for the universe of which the mystery we have not discovered yet, anything on earth must have its limit; so are men’s strength and ability. 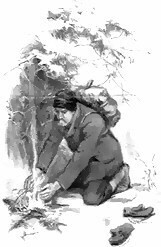 In his story “To Build a Fire”, Jack London described the failure of a lonely traveler struggling against the tremendous cold since he couldn’t overpass the law of limit. It is deficient if we do not point out another conflict between the man and his dog in which the animal played a passive role. The man wanted to kill the dog to warm his hands; the dog sensed the danger but it did not want to fight against its master. The only thing it could do was to run away from the man. By using both the omniscient and objective points of view, Jack London didn’t simply tell us the characters’ actions, but also revealed what they though and felt. Thanks to London’s experience as a sailor, a miner, and a traveler, he had the competence to describe thoroughly and exactly step by step the development of each character’s emotions. This helps us to share the joy, the pain and the difficulties the characters endured.